The subject of citadels and castles is the stuff of which children books, computer games and tourist attractions are made of. One can wonder why this is so. What is the lure of huge walls, iron doors, dungeons and the images of human torture and suffering? What is – to be more general – so attractive in the act of fighting, making war and its subsequent architectural endeavors to counteract its effects? The simple answer, as seen from a quadralectic point of view, is found in the celebration of a form of visible visibility (of the Third Quadrant). The physical presence of power, either in the shining of impressive armory or in the noisy red fire engines or black police cars speeding through the streets, has always attracted the attention of impressionable personalities (which are we all!). Drawings of war machines were already a pastime of Leonardo da Vinci (1452 – 1519). It is also a given fact that the function to defend oneself is elementary for a human being. And the structures and contraptions to provide that protection always have a deep human interest, because it can – in a conflict – save our lives. Even if such situations are not pressing, there is still a fascination with the notion of Power, which presents itself in a certain situation as a rather vague, but sometimes as a clear psychological entity, urging an individual to act and behave in a certain way. Fig. 744 – The Herodium was built by Herod the Great around 24 BC and had a dual function as palace and fortress. 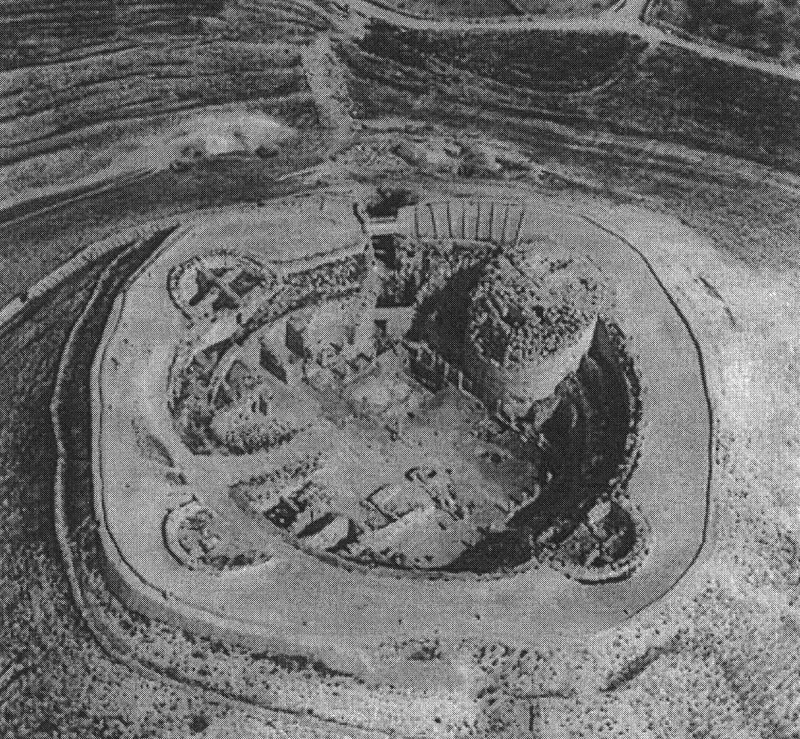 The palace-fortress Herodium (or Herodion) was built by Herod the Great around 24 BC on the flattened top of a hill south east of Bethlehem (fig. 744). The roof and upper stories of the Herodium are no longer existent, but the remains of the four towers are still present. Flavius Josephus described the fortress in his history of the Jewish people, when it acted, together with Masada near the Dead Sea and Machaerus (Jordan) as the last stances held by the Jews after the destruction of Jerusalem in 70 AD. The Herodium was conquered by the Romans in 71 AD. The architectural combination of a fortress and a palace in this compact form was born in a necessity, since Herod was not very popular as a representative of the oppressive Roman power. 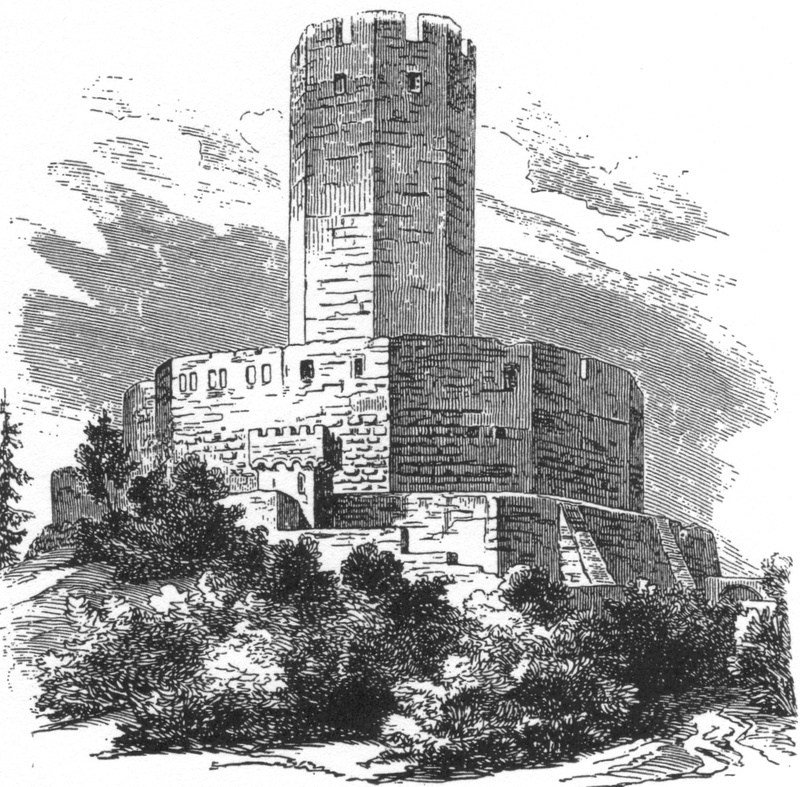 The eastern round tower had a diameter of eighteen meters and acted as hiding place in times of danger. The other three semi-circular towers were sixteen meters in diameter. Herod’s palace stood within the fortification. There were also tunnels and cisterns, some of which were used as hiding places during the Bar Kochba Rebellion (133 – 134 AD) when the Herodium was once again besieged by the Romans. 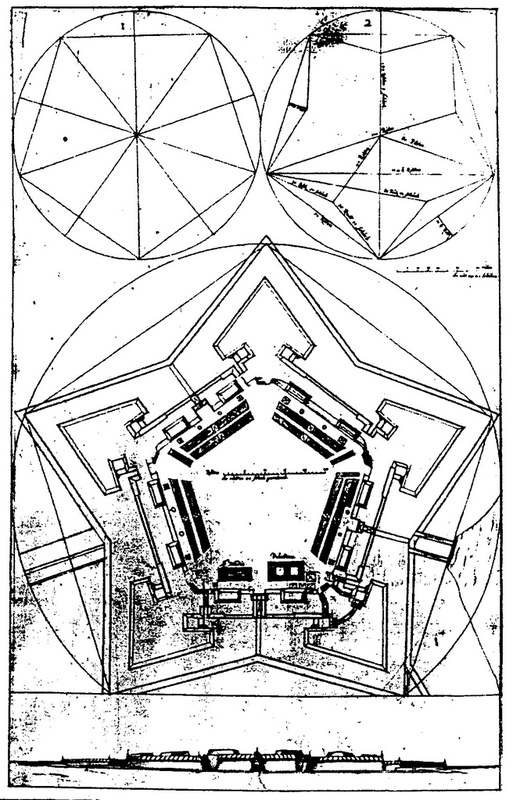 JACOBSON (1986) mentioned the fortress as one of the earlier examples of the use of ruler and compass in architectural design. This method became en vogue in the Roman Empire during the reign of Emperor Hadrian some century and a half later. The history of circular geometry in architecture is much older than the ‘Teatro Marittimo’ at Hadrian’s Villa in Tivoli or Herod’s palace-fortress in Herodium. Fig. 745 – The octagonal Steinsberg Castle near Sinsheim (Germany) was a ‘Ministerialenburg’, built in the middle of the thirteenth century as one of many such fortifications in Europe. The ministeriale was in the early Middle Ages an official, providing services and protection to the ruling class. Their importance grew in the High Middle Ages, when the knights in their castles played a major role in the cultural development. The range of defense works in Europe seems to make a transgression from the use of natural geographical features, like hilltops (fig. 745), to all types of structures in various forms of complexity in flat terrain (fig. 746). Fig. 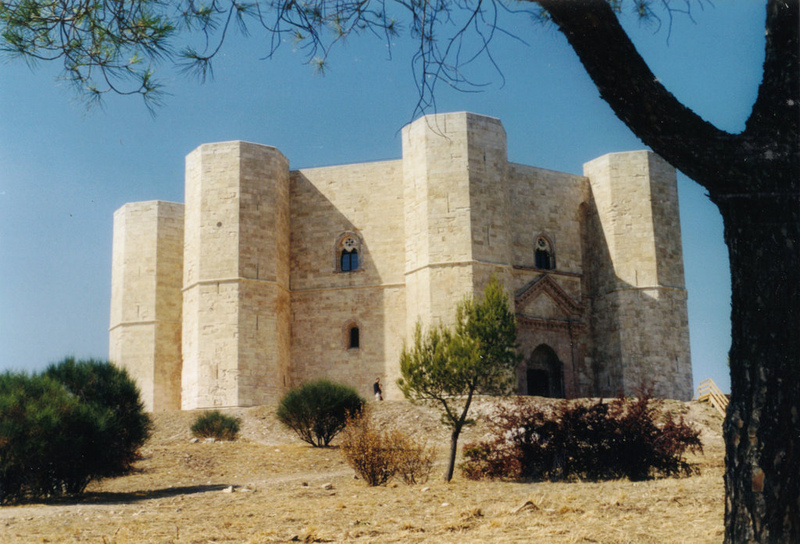 746 – To the left: The Castel del Monte in Apulia (Italia) is a classical example of a geometric defense structure. It was built as a hunting lodge by Holy Roman Emperor Frederick II around 1240. The octagonal shape might be inspired by the Dome of the Rock in Jerusalem, which he had seen on the Sixth Crusade in 1229. Right: The rectangular castle in Prato (Tuscany), near Florence. Castel del Monte – Photo: Marten Kuilman (2000). The architectural variety of castles in Europe in the High Middle Ages (1000 – 1250) reflects the searching for adequate forms in an age of struggles with relative moderate weaponry. Attacks with spears, axes, bow-and-arrows and battering-rams implied the building of obstructions to counteract these weapons. High walls, preferably with moats or water in front, and towers to keep an overview and last stand were often sufficient to deter an enemy. The early use of symmetry can be seen in the Castel del Monte (Apulia), but other castles had a square form – like the castle of Prato (Tuscany) and the Castello di Lago Pesole near Avigliano (Potenza) and many others. 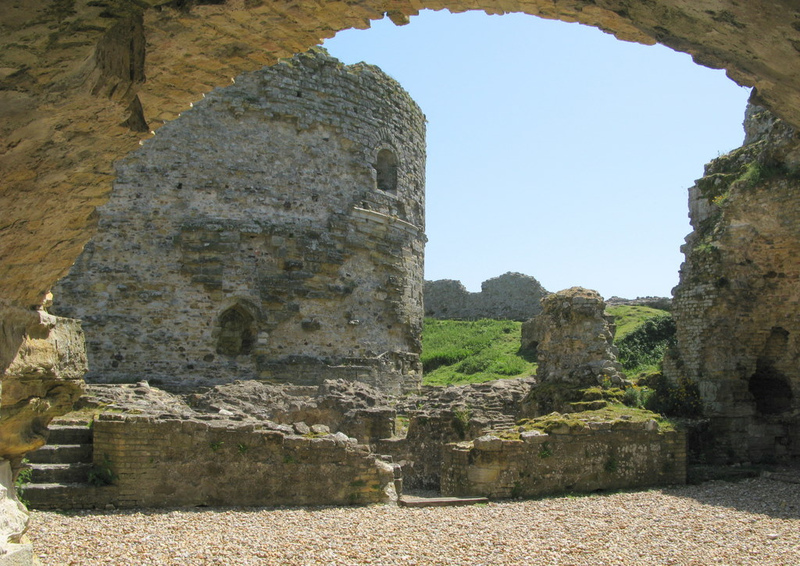 The Camber Castle, near Rye, was originally built between 1512 and 1514 as a round tower by Sir Edward Guldeford to protect the harbor (the Camber). A treaty in 1538 between France and Spain left England vulnerable to attacks from these countries and Henry VIII had forts constructed on strategic sites along the south coast. The circular tower was (in 1539) incorporated in an octagonal wall with four bastions, with an entrance bastion in the north west. The bastion has curved walls because it had to meet the needs of artillery warfare. The rounded shape of the bastions was necessary to deflect the cannon balls. Camber Castle – Photo: Marten Kuilman (2010). The plan shows some interesting intermingling of division patterns, which beg for further investigation (fig. 747). The Camber Castle, when it was completed in 1544, was second in size to Deal Castle, another of Henry VIII symmetrical fortifications. The castle only functioned for half a century because the silting of the Camber and the shift of the harbor entrance. The garrison left the castle in 1637. Fig. 747 – A plan of Camber Castle, near Rye shows the initial round donjon surrounded by an irregular hexagonal-octagonal pattern of walls interrupted by five towers, completed in 1544. Several geometrical patterns have crossed each other on this plan in a most ingenious way. 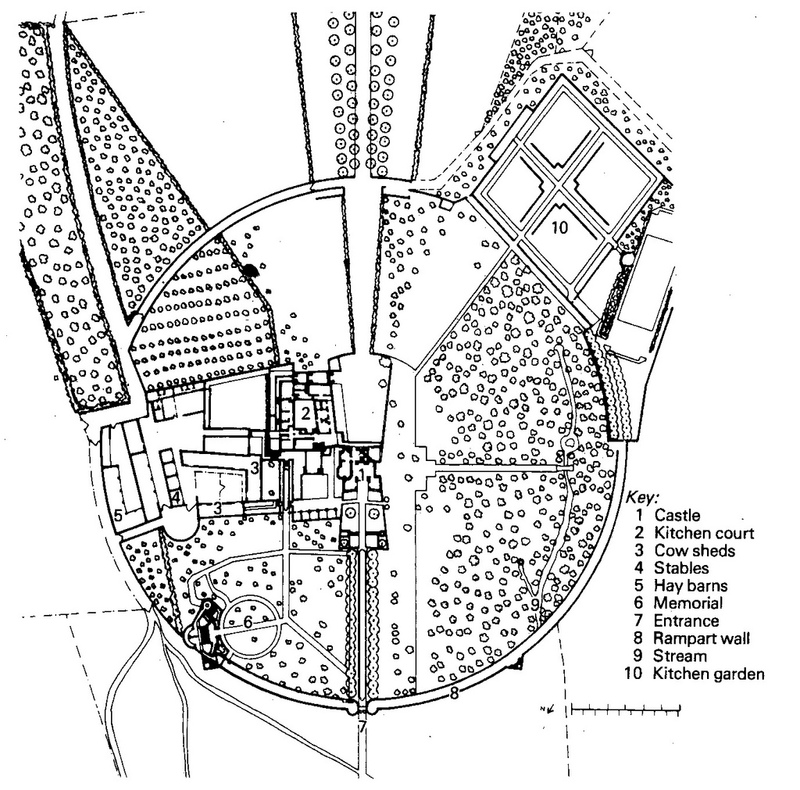 ALLCROFT (1908; p. 21) gave a classification of ‘Ancient Earthworks and Fortified Enclosures’ (in Great Britain) running from ancient, prehistoric times to the medieval and ending in Cromwellian times with the Royalist defenses, like Newark-on-Trent, which was besieged between the years 1642 and 1646. ‘The bastion’, Allcroft said (p. 605) ‘was an Italian invention belonging to the first quarter of the sixteenth century. Vauban perfected it during the latter half of the seventeenth century, in the wars of Louis XIV of France. ’The Italian roots of defense architecture were closely related to the rapid development of the geometrical spirit, which was part and parcel of the (Italian) Renaissance, but also pursuant to revolutionary developments in new weaponry propelled by gunpowder. Leonardo da Vinci (1452 – 1519) became the architect to the King of France and lived between 1516 and 1519 at Amboise, near Blois. It is possible that Leonardo, although all documents concerning the work are lost, designed the open staircase in the courtyard of the Chateau of Blois, one of the most celebrated specimen of its kind. His involvement in the nearby Chambord Castle – constructed between 1519 and 1547, was proposed by Charles Marcel-Reymond in 1913, but is questionable. Other candidates for the design are the architects Domenico da Cortana (c. 1465 – c. 1549) or Pierre Nepveu, a French architect from Amboise. The donjon-type of the castle is recognized as an early specimen of tetradic defense architecture in France (fig. 748). Many donjons, like that of the castle of Vincennes, are scattered over France as a lasting reference to tetradic architecture (MESQUI, 1993). Fig. 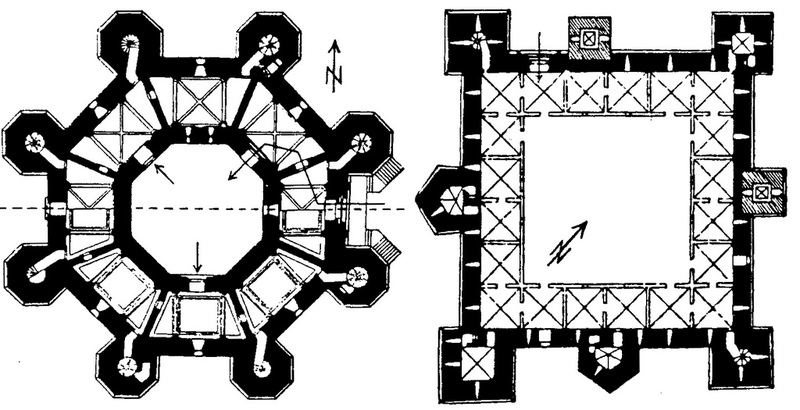 748 – An initial plan of the Chambord Castle, following a donjon-type of layout with a Greek cross division of the inner square. The plan was later extended to one of the larger and impressive chateaux of the Loire valley. The sixteenth and seventeenth centuries were ages of violence and upheaval over the greater part of Europe. This human behavior caused a great activity towards the building of defenses, or at least became an abstract obsession with this subject. Henrick Ruse’s book ‘Versterckte Vesting’ (published by Johannes Blaeu in Amsterdam in 1554) was just the start of a renewed interest in ‘geometry in the service of war’ (fig. 749). The book has a pivotal position in a distinct history of defenses and the idealistic inspired ‘model town’ based on strong walls, laid out in geometric patterns. This wider approach became necessary, because the force of the artillery had increased dramatically in this period with the introduction of gun power and iron cannon balls. The shape of the walls had to protect a city and outsmart the modern means of attack rather than the thickness of its walls. A bygone, ‘Renaissance’ element of geometry was always present. Fig. 749 – The frontispiece of Henrick Ruse’s book ‘Versterckte vesting’ published by Johannes Blaeu at Amsterdam in 1554. Ruse made his observations in the conflicts in the Netherlands, France, Germany, Italy, Dalmatia and Albania ‘and the surrounding countries’. This picture incorporates all the frantic activity towards the building of defense systems in the sixteenth century and is a specimen of the psychological state of Europe in that era (i.e. the Third Quadrant) of its cultural existence. The Bolognese engineer Francesco de Marchi (1504 – 1577) worked for such diverse rulers as Margaretha of Austria, Allessandro de Medici, Pope Paul III and Margaretha of Parma. His tractate about military architecture (‘Architettura Militare’) was eventually published in 1599, but the manuscript was already in circulation before 1565. He came to Antwerp (Belgium) in 1567 and had discussions with Francesco Paciotto, Chiappino Vitelli and Gabrio Serbelloni about the building of the citadel. However, his plan was not accepted, and the assignment went to Francesco Paciotto (fig. 750). De Marchi left the Low Countries and died ten years later in Italy. Fig. 750 – The citadel of Antwerp (Belgium) was designed by the Italian Francesco Paciotto in 1567. The ground plan of the building is a pentagon. The illustration is from Speckle’s standard work ‘Architectura von Festungen’ (1589). The chief engineer of the city of Strassbourg, Daniel Speckle, published his ‘Architectura von Festungen’ in 1589 (in the same year that he died). This book is a hallmark in the building of fortresses and can be regarded as a German answer to the Italians, who had taken the lead in this particular field. Speckle stated a program of defense architecture, which was recorded in 1859 by Friedrich Engels in ‘The New American Cyclopaedia’, under the caption ‘Fortifikation’ (Band VII). A city like Lucca (see fig. 708), in central Italy, is probably the finest example of a town in which huge energy was spent towards defenses, resulting in a model town (although it was never really attacked). It was the fear of violence, born in an oppositional mind, which led to these enormous (useless) activities. It is not known who designed the fortifications of Lucca, but it can be regarded as a characteristic example of the most advanced methods of the building of fortifications by the Italians in the sixteenth century. Work on the stronghold started in 1544 and was completed some hundred years later. Niccolò Machiavelli’s (1469 – 1527) book ‘Libro de la arte della guerra’ was published in Venice some ten years after his death and first appeared in English in 1560 (translated by Peter Whithorne). A thin (sixty-three pages), illustrated book of the fortification of cities was published in 1554 in Venice by Giovanni Battista di Zanchi (‘Del Modo di Fortificar la Citta’). Thomas Digges’ practical treatise named ‘Pantometria’ (London 1591) and Robert Barret’s ‘The theorike and pracktike of moderne warres’ (London, 1598) were just two of the many publications on warfare in the English language. Jorge Alberto Galindo DIAZ (1996) gave an extensive list of the treatises on military architecture in his doctoral thesis. The writings on war, conflicts and related subjects indicate – up to the present day – the continuous interest in the aggressive side of human behavior. The act of surviving is at the very bottom of this psychological phenomenon. Fig. 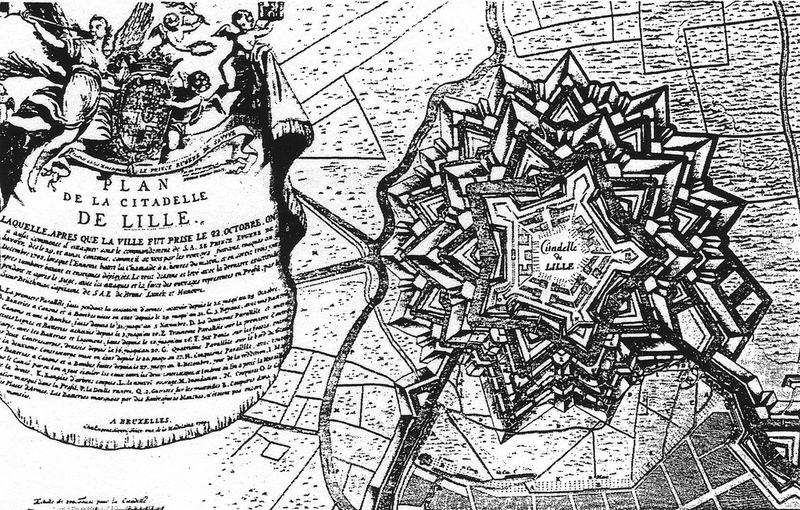 751 – The fortification of Lille (France) was designed by Vauban in 1709. The central geometric figure is a pentagon. The number four (and tetradic symmetry) was not a dominant factor in this period. The five-star outlay (like Antwerp, fig. 750) and pentagonal or hexagonal designs of fortifications were more often used, up to the fancy designs of Mannheim, Germany (see fig. 605), Lille (fig. 751) and many other cities throughout Europe. It seems that the consciousness of duality and division was more prone than the actual number of division. Once power is established, numbers are mere soldiers in an army, used to reach goals. King Louis XIV of France (1638 – 1715) was fond of sieges. ‘He greatly preferred them to pitched battles at which he never appeared. He seems to have regarded sieges as rather exciting court picnics’ said Sir Reginald Blomfield in his book on ‘the greatest military engineer that had ever existed’, Sebastien le Prestre de Vauban (BLOMFIELD, 1938). The city of Neuf-Brisach, in the Vosges (Haut-Rhin department), with plans drawn by Marquis de Vauban, can be seen as the epitome of citadel building (fig. 752). The city is situated on the left bank of the river and was built as a response to the destruction of original Breisach (on the right bank) in 1697 after the Treaty of Rijswijk. 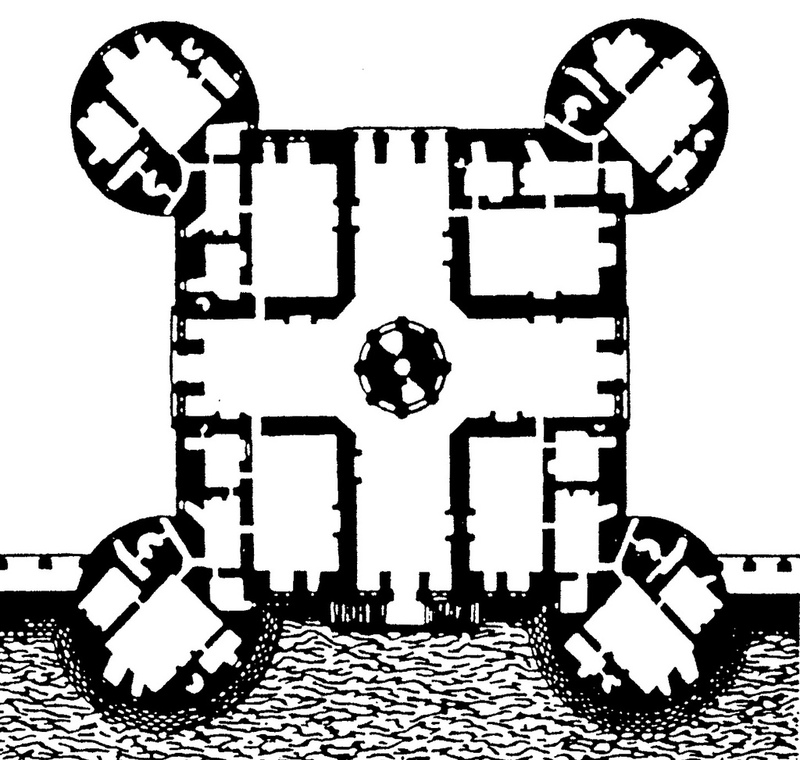 The design started off as an octagon with tower bastions and detached bastions (the so-called ‘third system’). The street followed a grid plan with a large square at the centre. The fortifications are still in a good condition despite a Prussian siege in 1870 and defense of the town by the Nazis in 1945. A Vauban Museum is housed in the Porte de Belfort. Fig. 752 – The street plan of Neuf-Brisach, a city designed by ‘the un-crowned king of fortifications’, the French engineer Vauban, follows the symbolic representations of a fortress town in the eighteenth century. Atlas Novus, 1730. A rather curious symbolic use of a fortress was expressed by the English doctor Robert Fludd (1574 – 1637) in his book ‘Medicina Catholica’ (Frankfurt, 1629), which was two years later issued in two volumes as ‘Integrum Morborum Mysterium sive Medicina Catholica’ (1631). 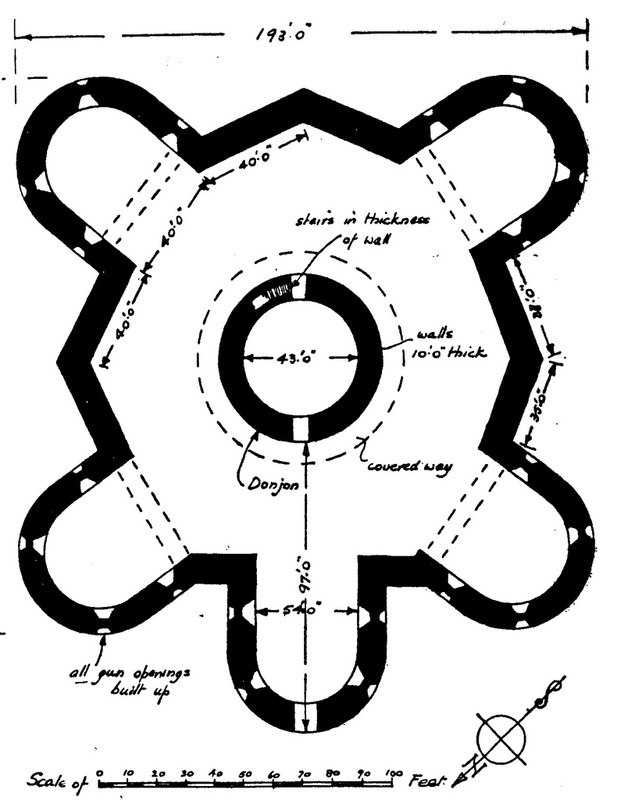 Fludd showed a donjon-type of the castle with a Homo Sanus in the middle (fig. 753). Fig. 753 – ‘The Art of Preserving Health’ as envisaged by the English physician Robert Fludd. The illustration indicates a healthy human or ‘sound man’ (homo sanus) being attacked from four sides by diseases. He kneels within his fortress to address God (‘How great is thy goodness’, Psalm 19). The latter replies: ‘No evil shall befall thee, neither shall any plague come nigh thy dwelling; his angels shall have charge over thee…’ (Psalm 91). Fludd was an archetypal representative of the early seventeenth century man. He ventured, for instance, in music (De Musica Mundana, 1618). His masterwork was called ‘Utriusque Cosmi, Maioris scilicet Minoris, meta-physica, physica, atque technica Historia’ (The metaphysical, physical, and technical history of the two worlds, namely the greater and the lesser (1617 – 1621). He developed perpetual motion machines and was the first to discuss the circulation of blood – maybe earlier than his friend William Harvey (1578 – 1657), who got the credit for his work on the human heart. The fourfold scheme of Fludd has parallels with Blake’s Zoas and Jung’s psychology and fourfold magical symbolism, according to Gareth KNIGHT (1991). This similarity might find its mutual source in a turning to the four-fold as an escape from two-fold extremism. This move was certainly very common in Fludd’s time (the seventeenth century), but could also be applicable to the conceptual setting of Blake and Jung, when they proclaimed their spiritual institutions. It had been pointed out earlier, that the four-fold might be the result of oppositional tendencies in an evolutionary two-fold setting. The temporal positions of the users of this type of symbolism in the European cultural history were different, but the escape ‘mechanism’ could well be the same. 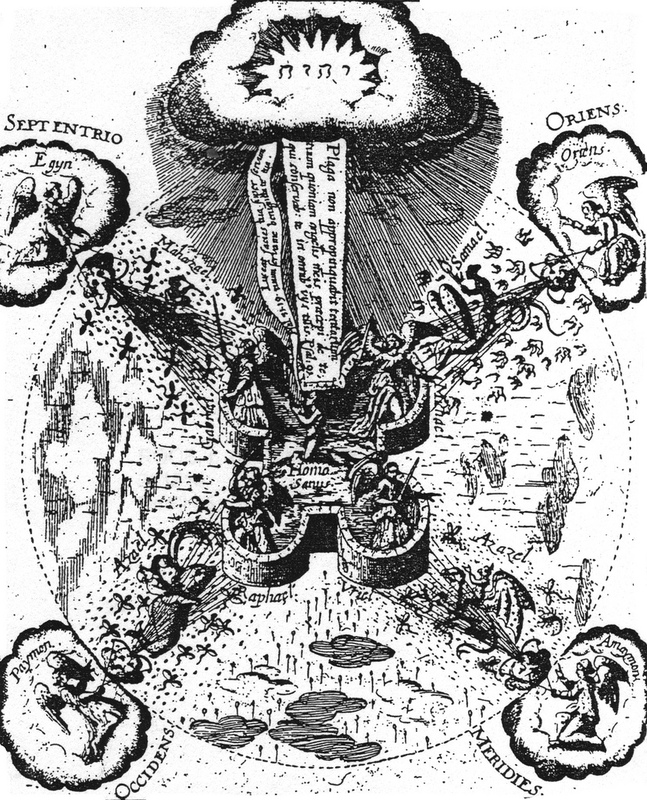 Fludd built his magical fortress around the Second Visibility Crisis (1650), Blake constructed his Zoas at the boundary of the Third and Fourth Quadrant (1800) and Jung created his fourfold (wo)man in the first part of the Fourth Quadrant – and probably they were all searching for the way out of the confinement of lower division thinking and hope to find a solution in the tetradic. The time between 1678 – 1688 was a period of frantic building in the Netherlands, since the Eighty Years War with Spain (1578 – 1648) had ended with the Treaty of Munster (1648) some thirty years earlier. One may wonder – and even draw some conclusions on a psychological level – why this feeling of protection suddenly surfaced after the greatest dangers had pasted. It seems that the crisis of the long war had left – after it finished – a feeling of intense uncertainty. The fourth part of the Third Quadrant (III, 4) can be qualified – in any communication? – as a time of recuperation and recovery by making (visible) defense structures. The feeling of security in Europe was damaged in the First Visibility Crisis (1350), and the material well-being became under threat in the Second Visibility Crisis (1650). The future was still open, but had to be safeguarded. Fig. 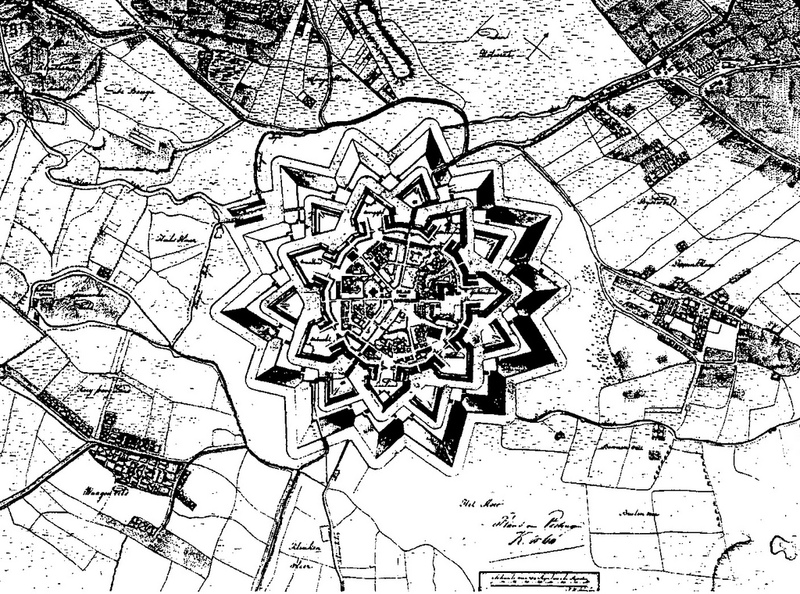 754 – A view of Coevorden (The Netherlands) in the period 1790 – 1795 displays an initial seven-fold division of the star-formed defense system, which doubles in the outer row to the fourteenth fold. The original defense works of the sixteenth century were five-fold, but they were demolished after the Spaniards lost their occupation in 1592. The new plans were designed by the distinguished military engineer Menno van Coehoorn (1641 – 1704) in 1680. The defenses of towns like Bergen op Zoom, Breda, ‘s-Hertogenbosch and Kampen were renewed, and three complete new defense projects were started, like Naarden, Grave, Sas van Gent and Coevorden (fig. 754). The knowledge of these concepts might have been derived from Paul Storff de Belville. He was a mercenary soldier, who had traveled through Europe. When the Peace of Aachen (in 1668) was reached, he moved to England in the service of Charles II to build defense works at the English coast and between 1671-1672 in Ireland (Charles Fort in Kinsale). Later he was borrowed to France and worked as an engineer under Vauban in the Southern Netherlands before he returned to England in 1677. He entered the service of the Dutch Republic in 1678 (SNEEP et al, 1982; WOUDA, 2008, p. 37). The Dutch colleague of Vauban was Menno van Coehoorn (1641 –1704). He designed plans for the cities of Zwolle, Nijmegen, Grave and Breda. The defense works of Bergen op Zoom were regarded as his masterpiece. 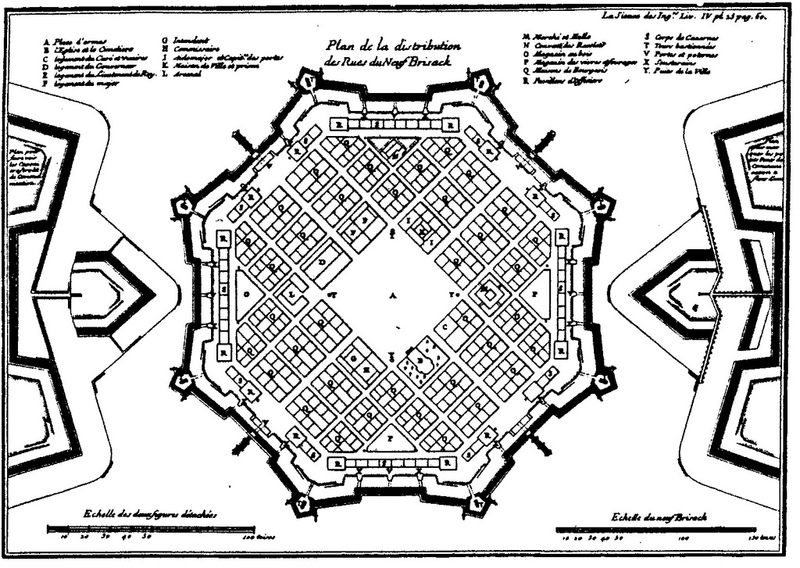 Their thoughts about the best type of defense were rather different: Vauban aimed at simplicity, while van Coehoorn liked surprises in the design. 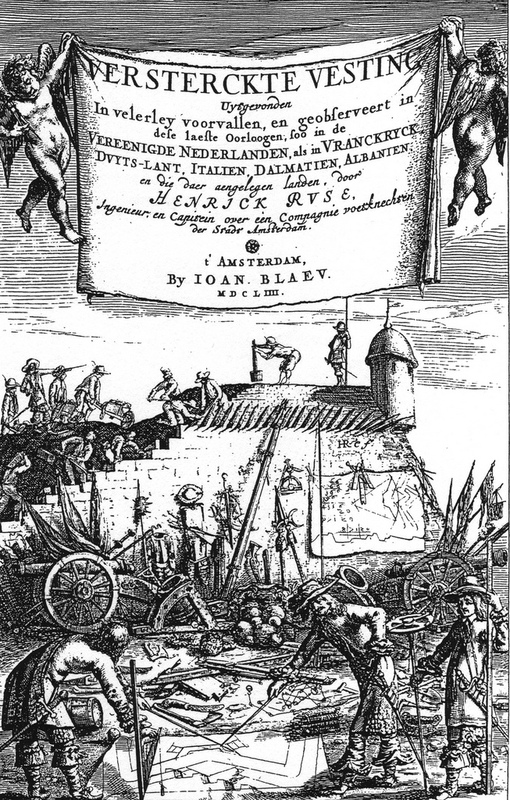 Van Coehoorn also became involved in a professional conflict with Louis Paen (working on the outlay of Naarden) about the ideal shape of a defense-town, which became known as the ‘Twist der Vijfhoecken’ (Struggle of the pentagons). Nan ELLIN (1997) wrote a book and several articles on the relation of fear and city building. She stated that fear has never been absent from the human experience and that protection from invaders might be the principal incentive for building cities. Ellin noted that the city-as-a-save-place has recently become associated with danger and a lack of safety. This trend started, in her opinion, in the year of the French Revolution (1789) and the conception of the panopticum by Jeremy Bentham (see fig. 363). The nature of fear changed in the early twentieth century when a modern type of industrial city developed, with an emphasis on time management. The city became a machine itself, reflecting a mechanical efficiency in its division of functions (zone regulations). Mass produced houses were the backbone the new city development. Ellin pointed out that the acceleration in the rate of change and the decline of the public space were the main reason for an increased sense of insecurity. Three different type of response were pinpointed: retribalization (a search for ‘roots’), nostalgia and escapism. The retirement communities are a form of separatism, just like the ‘gated communities’ (of which there are some twenty thousand in the United States alone). Security is a big issue here, materialized in high fences and sophisticated security equipment, with the ‘safe room’ as the ultimate place of security. The nostalgic response is reflected in renovation of old houses and the revitalization of warehouses and factories as living quarters. Another option of escapism is the building of fantasy worlds, like theme parks (Disney Land) and huge recreational buildings, like stadiums, convention centers and mega-stores. Fear as a psychological entity is something for the young, inexperienced adults facing the complexities of life and for the elderly and retired. In the latter case fear is often related to the end of their visible visibility period, known as death. Fear, as an instinctual emotion, is the most persistent and all-embracing of the four basic human emotions: fear, aggression, nurture and desire. The Greek word for fear is phobos, which points in a psychiatric context (phobia) to an intense and irrational situation, activity, things or persons. Emotional intensity is an important constituency of fear, which can be translated as a heightened visibility. The psychological entity of fear, as seen in a quadralectic context, is the emotion, which breaks loose shortly after a maximum approach (intensio) to one-self is experienced. The theme of anxiety and fear is closely related to the existentialism of the Danish philosopher Søren Kierkegaard (1813 – 1855). He placed in his book ‘The Concept of Anxiety’ (1844) the psychological entity of unfocused fear in an environment of sin, with a reference to Adam, who was forbidden to eat the apple (of the Tree of Knowledge of Good and Evil). The prohibition implied a form of freedom, either to eat or not to eat. Kierkegaard drew the conclusion that Adam’s state of initial bliss was the result of ignorance, which ended with the predicament of losing his freedom when consuming the ‘knowledge of good and evil’. The result is a state of anxiety, and a lost innocence. 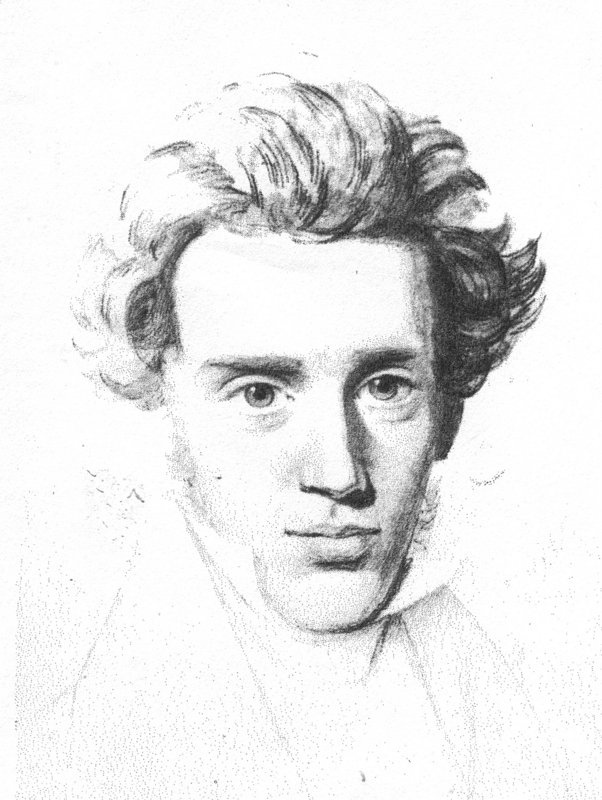 Søren Kierkegaard (1813 – 1855), writer of ‘The Concept of Anxiety’ (1844). The events unfolding around the ‘first sin’ can be compared to the philosophical-quadralectical implications of the ‘first division’ – and touches in many aspects the same psychological bedrock. The First Quadrant (I) was visualized as the place in a communication without any boundaries or divisions. The First Quadrant embodied – on a psychological level – an unknown situation before division (choice). The very moment of division – seen in Kierkegaard’s terminology as a ‘leap’, when ‘sin’ suddenly comes into the world – creates the freedom to choose (i.e. the type of division thinking). The position of this event is in a quadralectic communication situated at the border of the First and Second Quadrant. The Second Quadrant (II) is characterized by freedom and experimentation in a ‘state of innocence’ (of division thinking). Kierkegaard’s anxiety is produced by a state of ‘nothing’, which holds ‘a possibility of the repetition of the originary forced choice prior to its actualization’ (CAMERON, 2007; p. 99). The group of young adults and the elderly, who are the most vulnerable to the effects of fear, could be seen in a wider, quadralectic perspective. These hypothetical clusters – with their lost innocence – can be placed on a universal communication graph (CF-graph) of an average human life with a duration of eighty years (fig. 755). The increased awareness takes place in the fourth part of the Second (II, 4) for the young adults and in the second part of the Fourth Quadrant (IV, 2) for the elderly. 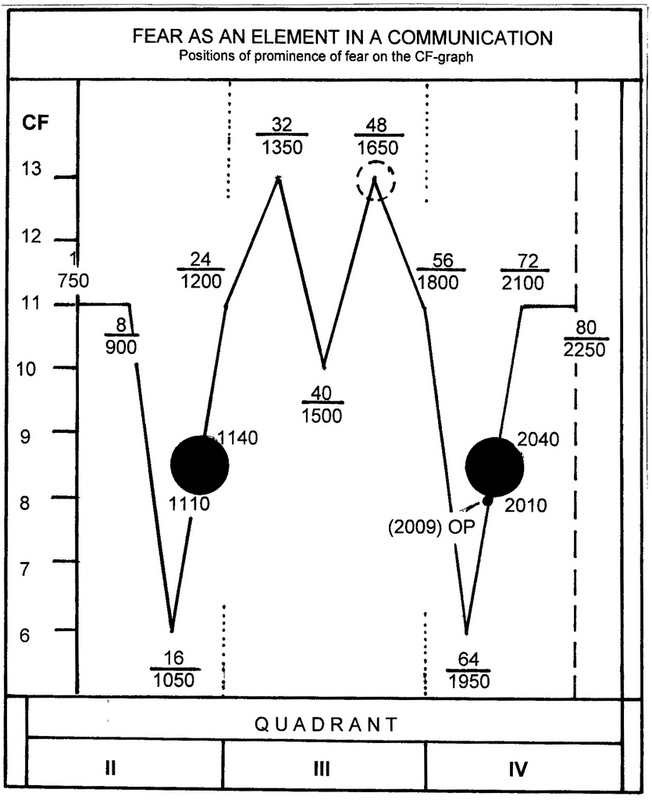 The marker points of fear are approximately between the CF-values 8 and 9 in an upward movement with increasing CF-values. The Observational Presence (OP) – which is the position in time of the observer (writer) – is in 2009 (when this graph was created). Fig. 755 – The position of the prominence of fear as a psychological entity on the universal communication graph compared to an average human life of a duration of eighty years (upper figures) and to a projection of the European cultural history (lower figures). The young adults are in the process of leaving their family homes to enter a vast moving world of uncertainty. The elderly people face the other side of the coin, with diminishing movement and a need to face the accomplishments of their life. A temporary review of life can cause disappointment and fear. Failure might be caused by bad luck, lost chances or other reasons, but there is no way to recover the past. The lack of perspective in the future can aggravate the situation, leading to the elementary emotion of fear. The period of a real, material setback in a communication is situated at the Second Visibility Crisis (SVC) (see Chapter 7). This position in the Third Quadrant (III) is different from the fear experienced in the Second and Fourth Quadrant. The former deals with life threatening experiences, while the latter two positions of fear have a more imaginary nature. The position of the SVC is indicated in the European cultural history around 1650 and in a common human life around the age of forty-eight years. Further observations into the historical consequences of this observation could lead to interesting conclusions with regards to the behavior of modern cultural units. For instance, it would place the present geopolitical situation of a young, adolescent American cultural entity (see fig. 619) and an elderly European cultural presence (see fig. 267) in a similar position with respect to their relation to a heightening of fear. Two different cultural settings recognize each other in a most basic human emotion: the former pursuant to a major blow of their self-confidence after the events of the 11th of September 2001 and the latter as a realization of the approach of (cultural) retirement. Many of the political decisions taken today might have, for these very reasons, the innate characteristics of fear. Nan ELLIN (2006) proposed a new sense of diversity in her book ‘Integral Urbanism’ as a remedy against the fear-measures of fortifying the city, but also against the wrongly attempted dismantling of boundaries and distinctions. Master planning is rejected, integral urbanism aims at connection, communication and celebration. The city should be given back to the people as a playground for the interaction, regardless of their background. The theme of ‘fear’ was taken up by the Belgian activist and philosopher Lieven de Cauter (Koolskamp, 1959). His network organization is called Oxumoron – meaning, in the right spelling as oxymoron, a trope uniting extremes or opposites. The name probably reflects the hidden oppositional mind of its creator. He described in his book (De CAUTER, 2004) a society (city), which was divided up to an individual level, following ideas from the Japanese architect Kisho Kurakawa (1934 – 2007). The latter was a founding member of the Japanese Metabolism movement, aiming at sustainable architecture with flexible urban models for a rapidly changing society. 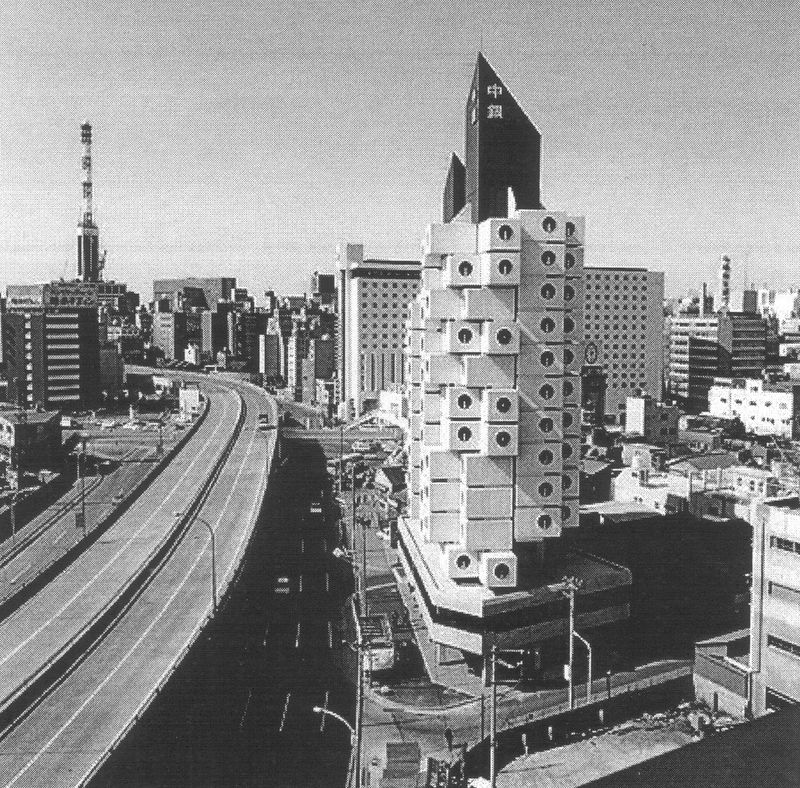 Kurakawa’s Nakagin Capsule Tower in the Ginza area of Tokyo brought the concept of an individual living space in 1972 into practice (fig. 756). Hundred and forty capsules (containers) were stacked at angles around two round central cores. The units are detachable and replaceable – but this method could probably not prevent its destruction in the near future to make way for new developments. Fig. 756 – The Nakagin Capsule Tower by the Japanese architect Kisho Kurokawa is a cellular building in the Shimbashi district of Tokyo (Japan). The building consists of two interconnected concrete towers, with prefabricated modules stacked along them. Four high-tension bolts connect the individual capsules to the main shafts for easy replacement. This idea did not materialize. 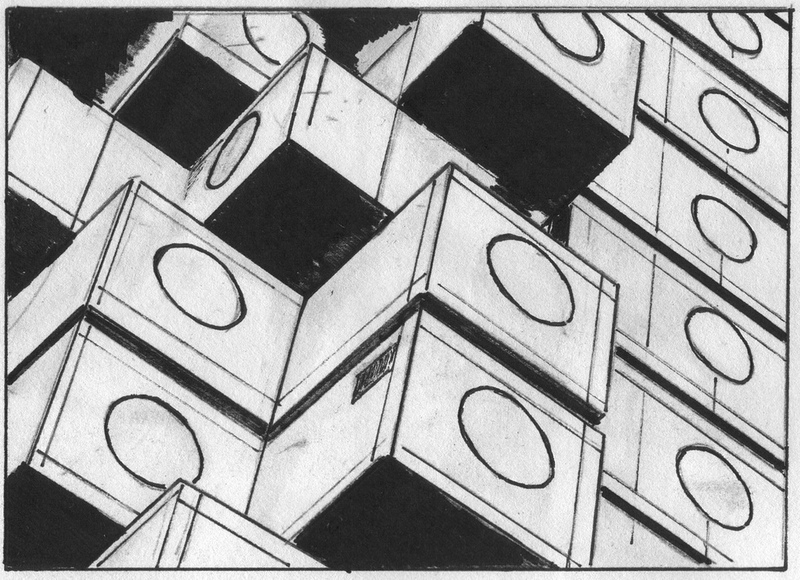 Nakagin Capsule Tower in Tokyo – Drawing by Marten Kuilman. De Cauter’s ‘capsular society’ is proposed as the ultimate protection against fear. It offers a bleak scenario for the near future in which ‘daily life is becoming a kaleidoscope of incidents and accidents, catastrophes and cataclysms’ (VIRILIO, 2003). Other philosophers, like the Italian Giorgio Agamben (Rome, 1942), derive their symbolism from the idea of a (prisoners) camp, in which people are brought together in an undemocratic way and have lost all their human rights. Modern ‘castles’ of the nineteenth and twentieth century (in Europe) often used the mixture of ancient lore and romanticism as an architectural tool to reach a visual impression (fig. 757). Some of them – as could be seen in chapter 3.9.4 – were outright follies, while others just used certain features of the ‘old’ defense structures (like towers) to create a historic setting. Fig. 757 – Lambay Castle in County Dublin was built by Sir Edwin Lutyens for the Hon. C. Baring, Lord Revelstoke (1905 – 1920). The central sixteenth century fort was reconstructed. A circular wall enclosed a self-contained paradise in Lutyens’ view. The idea of (medieval) defense structures found its way in the huge walls of modern high-rise buildings, with their glittering glass and metal. They are built to impress any visual ‘attacker’ and activate the senses (as Fourth Quadrant expressions). The result is a feeling of awe and fear. The conclusion of this short survey on fortification points to a relation between the spirit of the time and the design of fortifications, based on fear – either real or imaginary. Oppositional thinking is the base of any type of defense building, because without conflict, there would be no fortification. Expressions of insecurity become visible in the Third Quadrant (III) of a quadralectic communication, but a sense of fear is known from the Second (II) and Fourth Quadrant (IV). The elementary-biological urge for survival is always associated with existential fear. This undetermined anxiety is, in turn, closely related to particular (division) choices, which are being made throughout the process of living. The great question in life is the degree of ‘free will’, which is available in the ‘fixed’ pattern of visibility as expressed in the universal CF-graph.